Last week was the kind of week where we saw a black hole for the first time, former Stormy Daniels lawyer Michael Avenatti got hit with 36 charges of tax dodging, perjury, and theft, the National Enquirer maybe went up for sale, and Benjamin Netanyahu won a fifth term as Israel’s prime minister. If you’re wondering what else people have been talking about over the past seven days, these tidbits are a good place to start. What Happened: Something is happening at the Department of Homeland Security, with multiple figures being pushed out by the White House and the word “purge” being thrown around like it’s nothing. What Really Happened: Perhaps the US political story of the past week actually got started almost exactly seven days ago, when this news broke on what was otherwise an unusually quiet Sunday. 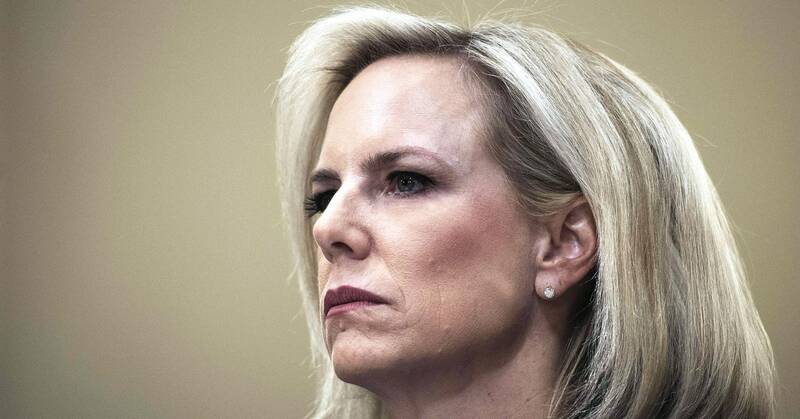 Yes, Homeland Security Secretary Kirstjen Nielsen was out after a meeting with President Trump. Even though the think piece industry made hay of the news—as did the behind–the–scenes stories—the actual news developed a few days later, with this announcement. At the same time as all of this was happening, there was a lot of conversation about the fact that the president had only just withdrawn his nomination for the next Immigration and Customs Enforcement director—Ron Vitiello, who resigned as acting director later in the week—apparently wanting someone “tougher.” Sound like a lot? Because if not, this also went down last week. Well, surely he’s being removed for good reas—OK, we can’t even finish that sentence. For anyone thinking, “Hey, it seems like a bunch of DHS people are disappearing at the same time, is something going on?” Well … yes. So, what is going on? Nothing good, to say the least. Of course, to hear President Trump tell it, he’s not into separating families at all. Just the opposite apparently. It should go without saying, but let’s just make sure: He’s not telling the truth. When it comes to what’s going on with the Department of Homeland Security as the president seeks to reset his policies, the word “purge” was being thrown around by many, which isn’t a good sign. The Takeaway: This tweet from Saturday proved to be somewhat prescient, apparently. What Happened: If there were those still undecided about Attorney General Bill Barr after his actions surrounding Special Counsel Robert Mueller’s report, he might have made up some people’s minds last week with two appearances before Congress. What Really Happened: Amidst all manner of suspicion over how he’d handled—and potentially, subverted—Mueller’s investigation into potential collusion between Russians and the Trump campaign of 2016, Attorney General Bill Barr appeared before Congress last week across two days (in theory, to talk about the Department of Justice’s budget, although the reality was very different) for what was perhaps one of the most anticipated pieces of political theater in recent memory. On his first day of testimony, Barr was asked a lot about his summary of the Mueller report. He wasn’t in a particularly talkative mood on the subject, as it turned out. That said, he was willing to share a couple of newsworthy details. The next day, Barr returned to testify once again, and he was far more excited to share on a different topic altogether—one that made headlines, for entirely understandable reasons. Yes, the Attorney General of the United States testified to Congress that one of the president’s pet theories is something that he’s looking into—and he specifically used the term “spying,” which was noted even during his testimony. Why is the language Barr used a big deal? Well, because what he’s talking about might not actually be spying at all. There is a particular irony in Barr investigating what he describes as spying, as anyone who remembers his first tenure as AG likely understands. Still, the intended audience for Barr’s comments was, at least, appropriately appreciative. Meanwhile, all of the spying talk distracted from something else interesting revealed during Wednesday’s testimony. The Takeaway: Remember when people thought Barr could be someone who’d treat the Mueller investigation fairly and wouldn’t be too biased because he and Robert Mueller were good friends? What Happened: There are times when it almost seems as if Treasury Secretary Steven Mnuchin is trying to make himself look bad. Last week, an appearance before Congress was most definitely one of those times. For those wondering how Mnuchin fared when dealing with people asking him questions in a public setting, let’s just say that he didn’t do great. Actually, Mnuchin revealed that himself on Twitter not long after. But back to his awkward, embarrassing, yet very compelling antics in front of Congress. Well, that went well. Still, surely Mnuchin was appropriately apologetic and humble about his attitude a day later. The Takeaway: If nothing else, we can all agree that Mnuchin definitely came across as someone who was very cool about meetings, right? What Happened: With a new deadline looming, it was (another) week of important negotiations and votes for the United Kingdom in regards to Brexit. As always, the question of just what is going on is a complicated one. What Really Happened: Let’s return, as we almost certainly must, to the United Kingdom and to Brexit. For those paying attention—which, by this point, has to be everyone, surely, right?—last week started as the latest in a long line of endpoints, with the rescheduled Brexit targeted for April 12 if no deal could be agreed on by Parliament by that point. Except, of course, something happened last week to complicate that. So, what did this mean in reality? The short answer is… maybe something, maybe nothing. By midweek, British Prime Minister Theresa May was back in front of European Union leaders, trying to sort out another extension for the clearly troubled Brexit. Not everyone was optimistic about her chances ahead of time, as could be seen by a letter to European leaders from European Council president Donald Tusk. But, in the end, everyone seemed to agree that another, second delay to Brexit was preferable than the No Deal reality that was staring both the United Kingdom and Europe in the face. For everyone wondering just what this actually means beyond “Thank goodness that Friday deadline’s moved again,” Twitter was happy to explain. And what that means is … not good for May. Well, she did try to quit earlier over this, after all… Now? That’s as up in the air as anything, it seems. The Takeaway: In announcing the new delay to Brexit, Donald Tusk won the award for Advice Most Likely to Be Ignored By Everyone Involved for the year. What Happened: After almost seven years, WikiLeaks founder Julian Assange was removed from the Ecuadorian Embassy in London, and arrested. So, that happened. What Really Happened: Thursday morning, in a surprise move that ended literally years of speculation about whether it would ever happen, WikiLeaks founder Julian Assange was arrested by British authorities after losing his political asylum in the Ecuadorian embassy. His removal from the embassy was captured by news agency Rupty, part of the Russia Today network. The London Metropolitan Police soon confirmed the arrest. And British Home Secretary Sajid Javid released a statement on the matter, as well. What was behind the arrest? Turns out, US United authorities had requested he be extradited, as Assange’s attorney made public. Immediately, people started speaking out. As of this writing, it’s unclear what the next steps in this story will be, but let’s be real: You know that the president is going to say something about this soon, and it might not be a repeat of his 2016 declaration of love. Or, really, any of them. The Takeaway: Take it away, Assange.